Silver Dime Necklace, Mercury Dime Necklace, Silver Coin Necklace, Winged Messenger Necklace, Sterling silver chain. 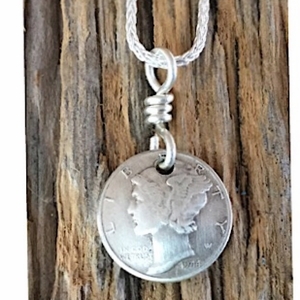 Coin Necklace, Dime Jewelry, Handmade Dime Necklace. Sterling Silver authentic Mercury Dime with Sterling silver topper and Silver Wheat chain, Chain is 18 inches long, The wings on the head of the Mercury Dime represent freedom of thought in Mythology.